We design and manufacture high quality, high reliability, innovative electronic products for a range of applications and industries. Our rare combined design and manufacturing capabilities enable us to develop innovative electronic products, on a short timeframe, from concept through to final production and manufacture. With 40 years of specialist experience, we offer a full turnkey solution for all your electronic engineering needs. Please note we will be on extended Easter break from 18/04, returning 24/04. We have over 30 years of experience in electronic design, covering a wide range of industries including: Security Services, Healthcare, Power, Vehicle Manufacture, HVAC etc. 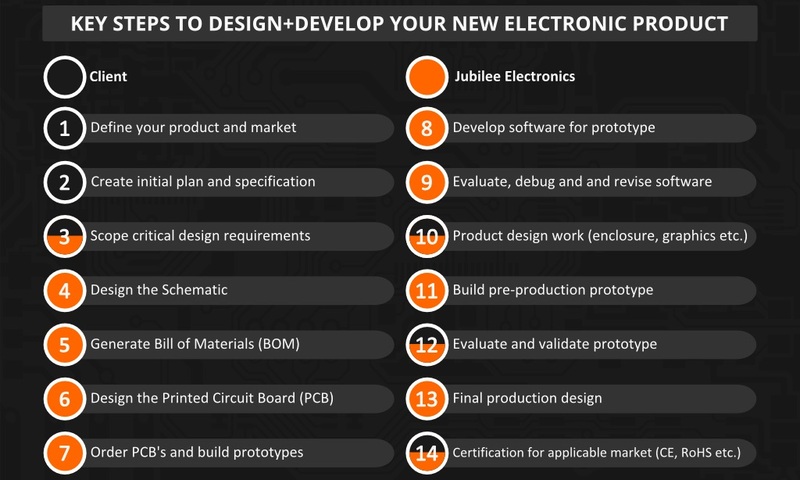 Click here to see how we provide a complete design service for your electronic product. Please see our Gallery area for further information and examples. We have experience designing and supporting systems using a large variety of embedded microprocessors. We are also an authorized Microchip design partner. Import mechanical drawings into our CAD system to enable PCB’s to be fitted into unusual spaces. We offer a UK based full electronics manufacturing solution for your project. 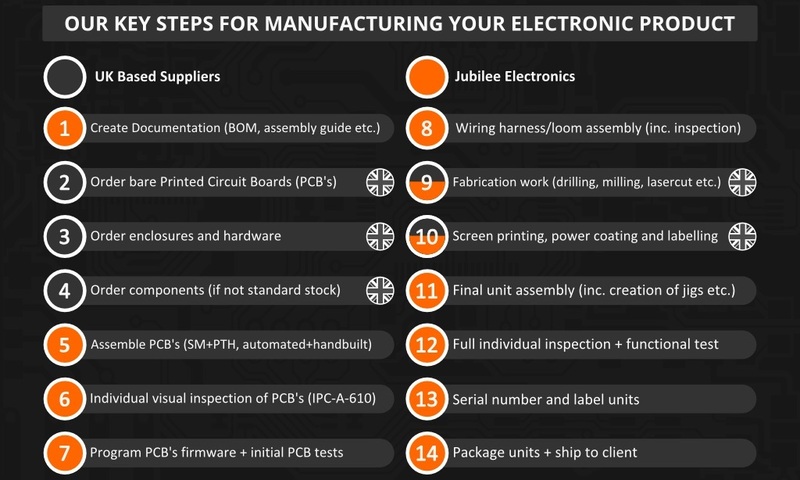 Click here to see how we provide a complete manufacturing service for your electronic product. Our fully RoHS compliant PCB assembly facilities can support projects ranging from one off prototypes through to high quantity production runs. We support both through-hole and surface mount technologies, and pride ourselves on the quality and efficiency of our work. We use a combination of automated SMT assembly lines and hand soldering and assembly techniques. We have carefully chosen our automated assembly equipment (Intelligent Drives iMP placement, vapour phase reflow etc.) to support rapid programming and set up times, making us ideal for fast turnaround projects. Our PCB's are manufactured in the UK, and are individually inspected and fully tested after assembly to ensure a quality reliable end product. Our staff are IPC-A-610 qualified, and we maintain our high standards by incorporating strict quality control procedures, with constant testing and monitoring of all PCB's and construction processes. We will happily quote for initial 'one off' prototypes through to large quantity assembly runs. Over 30 years of PCB assembly experience. Support for 1 off prototypes through to high quantity production. Fast turnaround for time critical projects. Hand soldering and assembly for through-hole and SMT PCBs. Individual PCB inspection and testing. We have been designing and manufacturing high quality, high reliability electronic products in the UK for over 30 years, undertaking projects ranging from quick turn-around prototypes to full production build and testing. We have years of experience developing manufacturing solutions for a wide range of industries, from small battery powered devices running at uA quiescent current for medical installations, to 3 phase industrial control systems for use in hazardous environments. Our wide range of capabilities can be utilised as individual services or combined to provide a complete 'end to end' manufacturing service. All products are individually inspected and tested to IPC-A-610 standards to ensure 100% functionality. We also use extensive in-house test equipment including high level metering, storage oscilloscopes and signal generators. All of our advanced test gear can also be linked to a computer for data logging and automated testing procedures. Full 'end to end' product manufacture. Cable and wiring loom assembly. Individual unit testing and inspection, including support for automated testing and data logging. 'Box build' and panel assembly work. Support for products ranging from low voltage/battery powered through to 3 phase industrial installations. 30+ years of experience manufacturing high reliability and high quality products. All products manufactured at our premises are subjected to rigorous inspection and testing throughout the production process. All PCB's are subjected to a full visual inspection prior to assembly. Following assembly boards are inspected following IPC-A-610 standards. Products are then tested for 100% functionality prior to shipping. For testing we use our own custom built test rigs, interfacing with a range of automated test equipment, and also develop bespoke testing software routines (including logging) where applicable. We do not carry out any batch testing on products manufactured at our premises at any stage of the assembly process. With 40 years of manufacturing experience, whether building a one-off prototype, or a production run of thousands of units, you can be assured that your project will be manufactured and tested to the highest standards. We design and assemble all our PCB's in house, using a combination of automated SMT machiner and hand assembly techniques. A selection of products that we designed and manufacture for our clients. We offer a full range of design services to take your project from specification through to manufacture. We have a range of facilities to accomodate rapid prototyping through to medium scale product manufacture. We have a wide range of in-house facilities to facilitate your product design and prototyping requirements. If you would like to discuss how we may be able to help you with electronic design for your project, please do not hesitate to contact us.